Now there are empty burden baskets. Drought – land parched to the perfection of pottery. 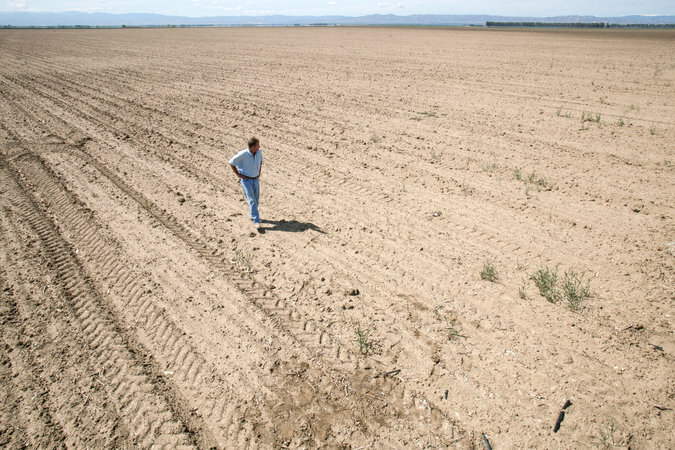 California’s once lusty farmland is thirsty. A dust storm is blowing hot breath on the horizon. It is difficult to walk in the mud that covers an Oso sad town. Glacial grief in the valley of the shadow of Slide Hill. Hoping to find someone that found a bit of air. Working feet stop and the silence is absorbed by the mud. Then a chorus of chainsaws resume. 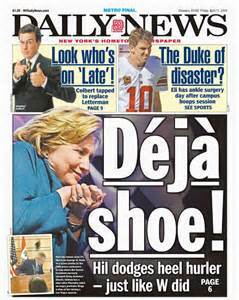 Fore-and-Aft … The Shoe Sails! Jeanne Kim recently summarized the antics of shoe-throwing replete with video re-plays. 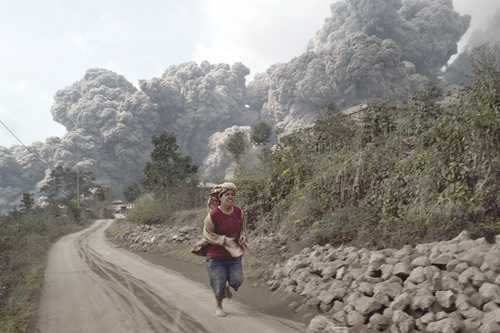 (April 15, 2014 in GlobalPost). You can watch these on the link below and enjoy the varied witty or not-so-witty repartees on the receiving ends. To aid and abet your viewing of shoe launches, here is the list of twelve targets followed by an out-of-order list of twelve random details that Kim discovered. When watching, try matching the sails. His police force bought him a shoe-catching net. His assailant asked for her shoe back. The shoe missed the target, bouncing off another person’s head. It was more a shoe-slap, than a shoe-throw. Two shoes were thrown: one representing the dead and the other representing the living. The assailant was a lawyer. The target acknowledged the shoe-throwing as a political privilege that his government has won for that country. A journalist unleashed his shoe because he felt he was being muzzled. The target guessed that it was a size ten shoe as it whizzed by. Middle East times three: the target, the assailant’s reasoning and the location. The target ignored the shoe and the unassailable accusations flung with it. Muntazer al-Zaidi could hardly have anticipated the extraordinary reaction when he hurled his shoes at George Bush to protest the invasion of Iraq. His “farewell kiss” to the US President has kept the previously unknown TV journalist in the center of global attention — a hero across the Arab world and beyond. Zaidi’s emergence as a role model for anti-American resistance was confirmed by the Iranian Ayatollah Ahmad Jannati, who praised what he called the “shoe intifada (uprising)” at Tehran University. In London, ‘Media Workers Against the War’ presented a box of shoes and a letter…to the US Embassy, stating the journalist was “guilty of nothing but expressing Iraqis’ legitimate and overwhelming opposition to the US-led occupation of their country”. Ayatollah Jannati called for the [infamous] shoes to be deposited in a museum in Iraq. But Judge al-Kinani revealed they had been destroyed by investigators trying to determine whether they contained explosives. Copycat footwear-hurling seems to have begun elsewhere, with a Ukrainian nationalist, as yet unnamed, throwing his boots at an Odessa speaker arguing in favor of NATO expansion. 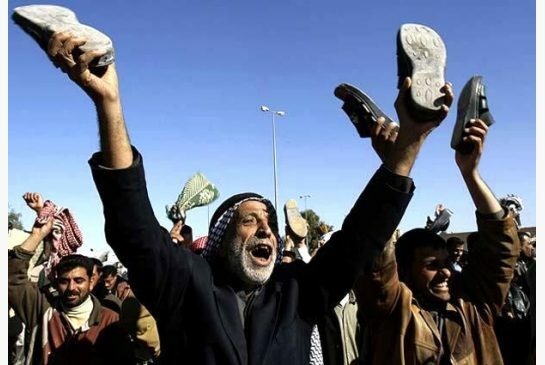 Photo shows Iraqis raising their shoes in Kufa, Iraq, on December 19, 2008, demanding the release of Muntazer al-Zaidi, who threw his shoes at the U.S. president the previous Sunday. How to Read a Flying Shoe? Duck and Shrug. Footwear – viewed in the Middle East as low and unclean – was hurled at his head, but a seemingly oblivious George W. Bush just ducked and shrugged. December 14, 2008 was a memorable day in the histrionics of polished shoes and politics. But, there was one question left for journalists to ponder in this saga. What does it take to actually offend George W. Bush? If not the greatest insult an Arab can muster – the hurling of footwear at a man’s head – then what?Is it that the photographic moment ricochets globally and stays, replaying in an endless loop for the ages?Or maybe that the Iraqi shoe-hurler himself is all but deified, replete with offers of marriage? No, not even those humiliations managed to penetrate the willfully oblivious presidential bubble, after Bush so deftly ducked and just as quickly shrugged off the leather projectiles at a that Baghdad news conference. “Whether or not Bush gets it – and he is famous for not getting international etiquette – this was a monumental offence,” says Mark McCrum, whose book ‘Going Dutch In Beijing’ chronicles faux pas in many cultures. 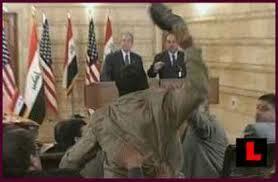 In fairness to Bush, it is easy to miss the sheer magnitude of shoe symbolism in the Middle East. But think back and you might recall that shoes played a starring role at the beginning of the Bush’s Iraq ordeal five years ago, when, just as the old regime collapsed, Iraqis spontaneously began removing their shoes and beating them against anything bearing the likeness of Saddam Hussein. A prospective free trade pact with the U.S. drew the wrath of tens of thousands of farmers and other workers in Seoul. 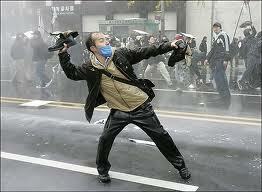 The photo shows a protester targeting riot police in Seoul on November 11, 2007. During the rally of 20,000-50,000 people, police arrested 100 saying that more than 10 officers were hurt.